As time goes on, Google and other search engines are getting better at evaluating the overall “quality” of a website. However, the overall quality of a site is indeed the sum of all of the pages on a site. This is common knowledge in the world of eCommerce SEO. Many online stores suffer from “thin content” problems. In a nutshell, if you sell T-shirts, you could have 6 pages about 1 T-shirt. In this scenario, there would be one good, unique page about the T-shirt, then 5 more pages which just say “red” or “XXL”. How this is remedied depends on the shopping platform but that’s a story for another day. The bottom line is, if Google has a problem with 30% of the pages on your site, your entire site is going to take a hit. Medical, Financial, Legal Content Oh my. Lots of websites covering medical conditions, mental health, dietary needs, financial planning, investing, stock trading or which provided legal information got obliterated during this update, mostly due to a lack of authority, which was mostly determined by their backlinks. The kicker here is that sites with a certain percentage of medical content also took a nosedive also. If you had a restaurant that sold 18 types of whiskey, you’d need a liquor license. Well, if your restaurant sells 2 types of whiskey, you’re still going to need a liquor license for glaringly obvious reasons. Google scrutinizes websites the same way. I am seeing it more and more. Should I delete the content? NoFollow, NoIndex, Delete. These are all your friends when it comes to content that you don’t want search engines holding you to strict standards for. Comment below if you were impacted in August, September, October, November or December of 2018 by one of Google’s latest quality updates and you think it was due to veering out of your niche into a YMYL content topic. I really appreciate your advice to stick to your niche if it’s not a YMYL website. 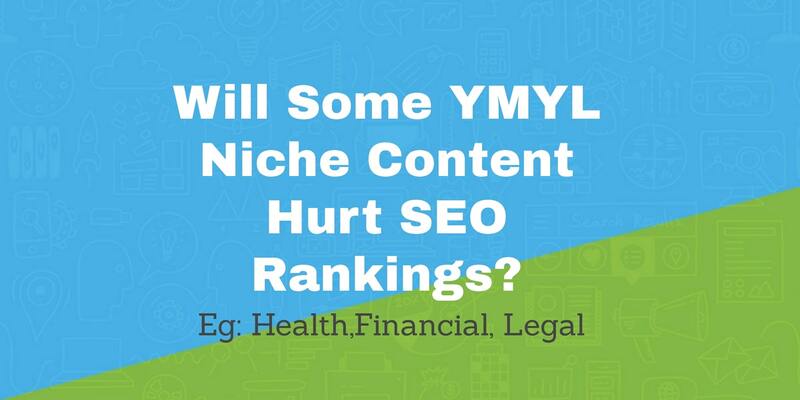 However do you have any advice on what best could be done for YMYL websites to improve their ranking post medic update. Mental health sites are heavily scrutinized by Google now. As far as E-A-T goes, the strongest correlation I have seen with rankings depends on the “T”, or TRUST. So how does Google “trust” a mental health site? Links.